Hi everyone. 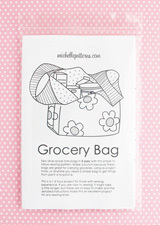 Today this small grocery bag is available as a sample. Sold - Thanks! 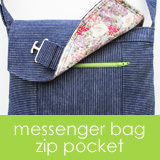 It is a similar size to the mini grocery bag, but with a closure loop. When I first made this I was excited about the loop, then I wasn't sure it was necessary, but after using one of these to hold my small yarn collection the loop turned out to be useful. 8/7/16 Update - The loop is not something I personally like with this bag. 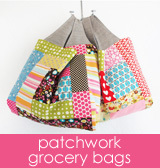 It tends to creep up and requires too much fiddling with to keep it down and holding the bag closed. There aren't any instructions for it, but you can see how it's attached in the photo below. This bag measures about 10" high x 9" wide x 2" deep (25 x 23 x 5 cm). If you would like this sample send me an email. My email is in the middle of the left column, above the "Follow me on Pinterest" button. The first person to email me about it will be invoiced through PayPal. Let me know in your note where you are located.